The Phoenix, a beautiful bird in mythology, is a symbol of resurrection and re-birth. The Phoenix Astronomical Society arose from the ashes of the Black Birch Observatory in the stunning South Island. Black Birch Mountain is in the South Island of Aotearoa/New Zealand, near Blenheim, and used to be the site of the Carter Observatory’s outstation and also the United States’ Naval Observatory, the latter suspected by many New Zealand peace campaigners of being engaged in weapons guidance systems. When the U.S. pulled out of Black Birch, the automated dome of one of their observatories was offered to founder members of TPAS. Like topsy TPAS grew rapidly and it became very clear that, as most members were new to astronomy, building a recreational observatory was more urgent than he originally planned research observatory. However, as a new society we didn’t have lots of funds, nor did we have a financial track record, so we have had to be creative in finding ways to raise money. Our members, our greatest asset, have been very supportive and cash donations, some of them very substantial, have been absolutely essential in enabling us to provide one of the best amateur observatories in the country. 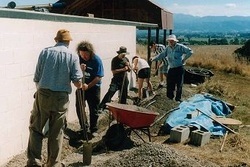 Other members have offered support in kind by participating in working bees, and helping to make our fund-raising activities, such as the New Zealand Almanac, so successful. This is what makes TPAS special: we have a friendly and enthusiastic membership that generally gets in behind and supports our many projects. We couldn’t do it without them! of stargazing from your own backyard should not be underestimated, and it certainly is the place to learn initially to find your way around the sky – binoculars are ideal for beginners. However, anyone with a real interest in astronomy eventually finds that they want to see more, and see better, and for that you need a dark sky. If you haven’t been to the Wairarapa yet, please make the effort to do so – you’ll see the night sky as you may never have seen it before. On a clear, moonless night the Milky Way and the Magellanic Clouds are magnificent, and through the Phoenix telescopes the stars along the Milky Way are a mass of multi-coloured gems. You can view the spiral arms of galaxies (plural), and can see colour in many nebulae. and Anglican minister, and was attended by over 150 people. The observatory contains four telescopes – the 6” F18 refractor that used to belong to Peter Read is on loan from the Carter Observatory; the 8” Meade Schmidt-Cassegrain telescope and the Phoenix 12” and 23” Dobsonian reflectors. to buy their own telescope then this can help them decide on the best instrument for their needs, as no telescope is completely multipurpose; the type of telescope to buy depends on what one wants to observe with it. The 15cm (6") Peter Read refractor is an excellent instrument for planetary and double star observation; the automated 20cm (8") Schmidt-Cassegrain is a good general purpose wide-field instrument, also good for astrophotography; the 12” Dobsonian is a really good telescope for beginners to use; and the Phoenix 58 cm (23") reflector is best for deep space objects such as nebulae and galaxies. who made the optics for the 1 meter telescope at Mount John, has been rebuilt to house a Schmidt camera and telescope made and used by Garry; this will be used to produce wide field astronomical photographs. The Matariki Research Observatory, is progressing under the guidance of Roger Gibb, Bernard Watt and Alan Tarrant. The optical system has been designed by Norman Rumsey, a world-renowned optics expert; the glass is being figured by Graeme Jonas, previously of Taranaki, currently in Wellington. 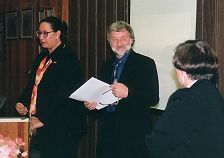 Research projects will be in the steady hands of Dr. Richard Dodd, ex Director of the Carter National Observatory of New Zealand. Once completed we will have a top class 24” research-grade telescope that will, with CCD camera and adaptive optics, have the ability to image objects that at one time needed something like the 200” Palomar telescope. The telescope and observatory will be completely automated with its own electronic guidance system and computers for data processing. TPAS has its own on-site clubroom that was moved on site on the 1st May 2001. The purpose of the clubrooms is to provide facilities for meetings, a place to relax and warm-up in between a cold night's astronomical activities, and a library. This too has been a wonderful example of our members’ generosity as people have donated not only time to paint, repair, and wire the building, but also items (and some cash) to furnish and generally make the building more comfortable. A grant from the Tararua Foundation assisted with the cost of a new floor, the Eastern and Central Community Trust and the Lotteries Gaming Commission have provided the wherewithal to add plumbing and toilet facilities. Oticon have provided the funding for a hearing loop. as well. In addition we convene Stardate in the Hawkes Bay each January and its winter version, the Winter Astrocamp, is held in Gladstone in the Wairarapa in June. In addition we have instituted beginners’ and advanced sessions in Wellington; monthly meetings in Wellington, the Wairarapa, and the Hawkes Bay; regular observing sessions or starparties (weather permitting), plus special ones such as those for the Leonid Meteor Shower; an annual Solstice Dinner, musical evenings, barbecues etc; and the crème de la crème, our much acclaimed monthly newsletter and webpage. Our latest venture is the construction of Stonehenge Aotearoa, not a ruin like the original in England, but one specially designed for this location. This is an educational astronomical tool for young and old and enhances the magnificent rural Wairarapa landscape with the Tararua Ranges as a stunning backdrop.